Johns Hopkins biomedical engineers have developed a free, browser-based online tool that could speed up the creation of new drugs to treat or prevent Ebola virus infections. 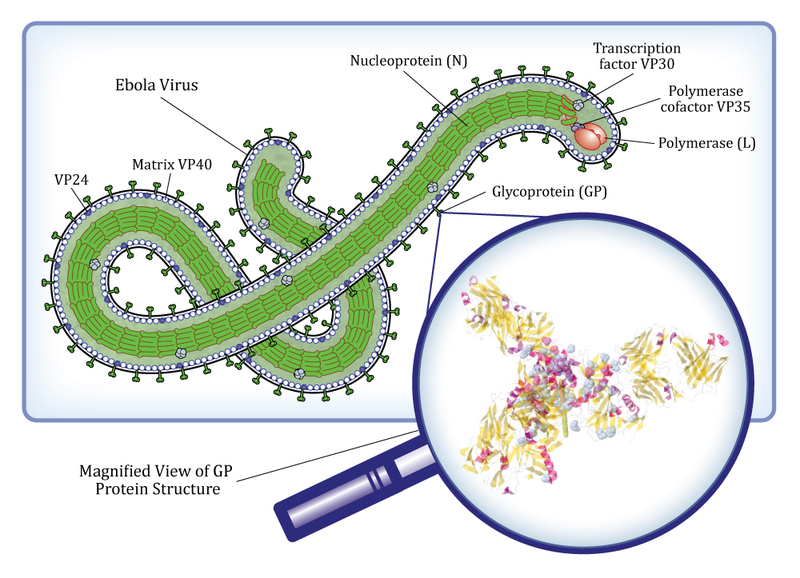 The software, called MuPIT Ebola Edition, enables a researcher to visualize Ebola gene mutations in the context of three-dimensional protein structures. It also offers views of antibody binding sites called epitopes that are situated on protein surfaces. These sites may give researchers new targets for preventive vaccines and serums to treat those who are already infected. MuPIT is short for Mutation Position Imaging Toolkit. “Learning more about the mutations and binding sites can be enormously valuable in developing new and better ways to treat Ebola patients and, ideally, to keep the virus from infecting people in the first place,” said Rachel Karchin, who supervised the project. Karchin is a Johns Hopkins associate professor of biomedical engineering, a William R. Brody Faculty Scholar and a core faculty member of the university’s Institute for Computational Medicine. Karchin pointed out that many existing vaccines are made by engineering specific antibodies, which are Y-shaped molecules that bind to viral surface proteins and help prevent the virus from replicating and spreading. For example, she said, the drug ZMapp, which was recently used to treat several Ebola-infected health care workers, is a cocktail of three antibodies. Karchin’s team designed its new digital display tool to connect with the new Ebola Genome Browser released recently by the University of California, Santa Cruz. The UCSC browser offers detailed genetic information about the virus. The Johns Hopkins add-on provides 3-D views of Ebola’s proteins, making it easier to interpret the functional implications of mutations and their relationship to Ebola virus evolution and its potential vulnerabilities. The Karchin Lab’s MuPIT Ebola Edition software was devised in response to a request from UCSC Cruz bioinformatics researcher David Haussler, who was one of Karchin’s graduate faculty advisers. She earned her PhD at the school in 2003. The MuPIT Ebola Edition browser can be accessed at http://mupit-ebola.icm.jhu.edu/ . “We hope to continually update and improve the tool through interaction with Ebola researchers,” Karchin said. Related color illustration is available; contact Phil Sneiderman.